Porous pavement is a green and sustainable alternative to traditional pavement. Porous pavement is a permeable pavement with a stone reservoir underneath that temporarily holds surface runoff, eventually draining into the subsoil. Although pervious concrete and porous asphalt may look the same as traditional concrete or asphalt, they do not behave the same. Porous pavement contains little or no sand and has open spaces that provide filtration and allow for the runoff from parking lots to filter right into the soil where the runoff will get quality water treatment. Porous pavement is ideal for overflow parking areas or most low traffic areas. Porous pavement may also be used to reduce hydroplaning when used on some highways as a surface material. Porous pavement can be applied in most areas of the country, but is not always suitable in cold climates. Porous pavement is not suitable where sand is applied to the surface of pavement because sand clogs the pavement’s surface. It is because of this that keeping the porous pavement cleaned and free of clogging debris. Although your winter maintenance practices may not utilize sand, sand will nevertheless get tracked each day onto the pavement’s surface. Additionally, vehicles parked on the area will leave behind snow and grit that need to be periodically removed. This is why proper porous pavement cleaning/maintenance is critical. Porous pavement requires more care than some other materials. If owners are not aware that their site contains porous pavement, they may not be insuring the regular maintenance activities that will allow the porous pavement to work properly. Do not seal or repave with materials that are non-porous. Always make sure the porous pavement is free from debris. Allow the porous pavement to drain between storms. Make sure the porous pavement is free from sediment and sand. 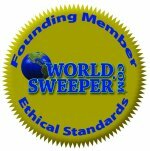 Vacuum Sweep regularly(generally three or four time per year) to remove sediment and debris. 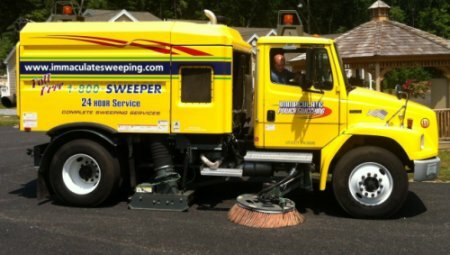 There are multiple types of sweeping units but not all of them are suitable for proper porous pavement maintenance. Some services use pure vacuum street sweepers or mechanical broom street sweepers. Neither of these sweepers are appropriate for porous pavement. 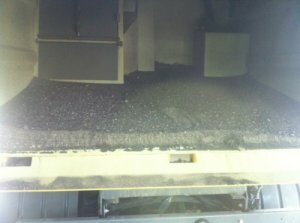 Pure vacuum sweepers are not effective because they typically clean only an area that is 27-30 inches wide, which is approximately 33% of the actual total area covered by the pure vacuum sweeper. Unless the remaining 67% of the area is treated with a mechanical transfer broom for pickup, the majority of the pavement is left unmaintained. Additionally, in several sweeping tests, transfer brooms failed to remove minute and fine particles that will impede the performance of porous pavement. It would better to forgo any sweeping than to sweep with a mechanical broom sweeper or transfer broom as mechanical broom sweepers actually breakdown particulates on the road surface, creating 60% more particulates than before sweeping. Regenerative air sweepers completely clean an area approximately 90 inches wide, nearly three times more as pure vacuum sweepers. When an air blast is utilized that is the same width as the sweeping head it cleans deep into the pavement spaces to expertly remove small particulates. The EPA has endorsed the use of a regenerative air sweeper as part of Porous Pavement Cleaning/Maintenance Best Management Practices. Immaculate Power Sweeping, LLC utilizes the most advanced regenerative air sweepers to thoroughly clean and maintain porous pavement surfaces. Centrifugal dust separators remove particulates from the airstream, so the air is cleaned before it is returned to the pavement surface. This way, material is not pushed further into the pavement surface. Likewise, our regenerative air sweepers actually blast down and clean deeper to better lift silt from the spaces and provide the necessary transfer and pickup actions to far more completely clean the surface. We always properly adjust the sweeping head thereby reducing potential seal loss. Additionally, before all cleanings, we adjust the rubber skirt according to manufacturer’s guidelines ensuring the most thorough porous pavement cleaning/maintenance. 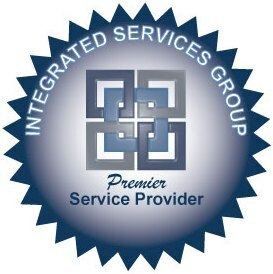 Immaculate Power Sweeping, LLC will reliably maintain your porous pavement on a regular cleaning schedule to make certain your investment in sustainable, permeable pavement is protected.